Identical SNPs that were discovered separately are listed in alphabetical order, not necessarily in the order of discovery, and separated by "/". Examples: P257/U6, L31/S149. L223 has been found to be unreliable and has been removed from the tree; PF3146 has taken its place. Listed 25 June 2013. P20_1, P20_2, P20_3 has been found to be an unreliable palindromic snp. Men in the same family do not have identical results; withdrawn from the tree on 10 August 2013. P18_1, P18_2, P18_3 has been found to be an unreliable palimdromic snp. Men in the same family do not have identical results; withdrawn from the tree on 9 December 2013. L177_1, L177_2, L177_2 has been found to be an unreliable palindromic snp; withdrawn from the tree on 10 December 2013. L353_1, L353_2 has been found to be an unreliable palindromic snp; withdrawn from the tree on 11 December 2013. L293 has been used in several studies, but it is difficult to test in some tests with problem adjacent areas on 3 January 2016. P16_1, P16_2 has been found to be an unreliable palindromic snp; withdrawn from the tree on 20 January 2013. PF3146 was withdrawn in favor of PF3147 in 2016. PF3146 is 99% the same at 500 adjacent base pairs with an X segment and thus attracts excessive numbers of divergent reads. L139 is located under L497. Listed 22 Jul 2009. L184 and L185 are located under M406. Listed 11 Dec 2009. L297 was found under L43. Listed 31 May 2011. L661 is located under L660 and L662. Listed 13 Oct 2011. L695 is located under L694. Listed 13 Oct 2011. L486 is found at approximately L497. Listed 26 April 2012. P76 is downstream of M285. Listed 5 August 2012. M287 is downstream of P287. Listed 5 August 2012. L1326 is found at approximately M285. Listed 1 December 2012. CTS11795.1 is found at approximately M201. Listed 17 March 2013. Z2009 is found at approximately Z2033. Listed 20 January 2013. Page99 is found somewhere within M201. Listed 3 January 2016. L1354 is found somewhere within Z2022. Added 3 January 2016. M547 is found somewhere within L30. Listed 3 January 2016. AM00821.1/F3378.1 is located somewhere under F1761. Listed 3 January 2016. Z3283, PF3408, PF3416 are somewhere within PF3359. Listed 3 January 2016. L1256, L1262, L1269, L1270 are downstream from L13. Listed 3 January 2016. Y-DNA haplogroup G. Scholars have proposed dates ranging from 10,000 to 23,000 years ago for the origin of this group using STR marker differences as the basis of their calculations. (Cinnioglu, Genographic Project site, Semino). Counting the differences in numbers of SNP mutations, one study (Wei) suggested that haplogroups more recent than haplogroup F (including G) had "a rapid expansion" dated at 41,000-52,000 years ago. Another study showed that haplogroup G was the first branching from haplogroup F among haplogroups G to T (Poznik). And this latter study — again counting SNP mutations — calculated about the same time frame for the emergence of haplogroup G based on its proportional branch length within its figure 2 which calculated the common male ancestor of all living men as living 120,000 to 156,000 years ago. A final study (Francalacci) which calibrated its calculations according to the first settlement of Sardinia gave an estimated age for haplogroup G as a separate branch as 76,670 years (mean number of mutations of 374 multiplied by 205 years per mutation, according to their data). Researchers have also suggested various places in western Asia as the site of origin of G, but the lack of ancient DNA from that period makes confirmation of this difficult. A unitary concept of haplogroup G often has little practical importance because virtually all G men belong to G subgroups that arose much more recently and have differing geographical distributions. G1-M285 is a much less common form of G found in populations than is G2. All haplogroup G1 men so far have the 12 value at marker DYS392 — rarely seen in G except in G1 men (G project data). G1 reaches parity with G2 only in parts of Iran reaching there up to 5 percent of all men. G1 is far less common in Europe, North Africa and Asia (G Project data, Cinnioglu, Regueiro, and DYS392=12 G1 estimates from Adams, El-Sabai, Ferri, Ghiani, Heber, Lovrecic, Nasidze-YHRD data from 3 studies, Rodriguez, Sengupta, Zalloua-2 studies). A Kazakh, a Middle Eastern and two Ashkenazi Jewish G1 subgroups exist (Biro, G project data). Using STR marker differences, Rootsi calculated the expansion time of M285 as 19,271 years ± 6,158 years. G2a1a-FGC595/Z6553. All G2a1 (FGC595/Z6553) men so far have the 10 value at marker DYS392 — rarely seen in G except in FGC595/Z6553 men. The subgroup FGC595/Z6553 (formerly P16) is found in high percentages in the central Caucasus Mountains area and is rare elsewhere. Small clusters are found among Ashkenazi Jews, some eastern Europeans and among Maronite Christians in Lebanon (Nasidze data in YHRD database, G project, Haber, Balanovsky and data). The Rootsi study — using STR marker differences — calculated the coalescence age estimate for FGC595/Z6553 at 9,400 years ago. Because of stability problems, P16 listed in the studies has been replaced on the tree by equivalent FGC595/Z6553. G2a2a-PF3147 men are found scattered throughout southwest and southern Asia and, though rare in Europe, reach observable levels in Corsica and Sardinia (Keller, Francalacci, G Project data). A double value for DYS19 in G is found almost exclusively within G2a2a though men with the same double value will not be reported as such. G2a2a includes Oetzi, the Iceman mummy preserved for over 5000 years in the Italian Alps (Keller). G2a2b1-M406 occurs in highest frequency in the eastern Mediterranean area reaching up to 5 percent of all men. A high percentage of M406 men have a value of 21 at marker DYS390 which is rare in G otherwise. M406 is more common in southern Europe than in northern Europe. A distinctive Ashkenazi Jewish subgroup of M406 exists (King, Rootsi, G project and Cinnioglu data). One study using STR marker differences calculated the expansion time for M406 in Anatolia at 12,800 years ago (Rootsi). G2a2b2a1-L140 is the dominant G group in Europe (perhaps 80 percent of G samples) and may reach up to about 7 percent of all men in a country but averages about 3 percent. A high percentage of G2a2b2a1 samples form three major subgroups, Z725+ (DYS388=13 and predominantly CTS4803+), Z2022+ (YCA=20,21) and Z1903+ (DYS568=9). One U1 subgroup within L140 (L1266) is the only L140 subgroup confirmed in some frequency outside Europe and that only in the Caucasus region, particularly in the northwest (G Project, Balanovsky, Rootsi data). North of the European borders of the once Roman Empire, the prevalence of these three L140 subgroups (and G in general) falls considerably, and the three subgroups are found in noticeable amounts in almost all regions of the once Roman Empire in Europe except among the Basques of Spain. The rapid expansion of these L140 groups seems to have occurred in the European Bronze Age. An Ashkenazi Jewish cluster from northeastern Europe comprises about half of the Z1903 subgroup, and this Jewish subgroup represents an exception to usual European boundaries mentioned. An unusual concentration of Z1903 men occurs in Sardinia, and a high concentration of L497 was also found in isolated valleys of southwestern Austria. The connection of the three main L140 subgroups to Sea Peoples, Etruscans, Alans and Sarmatians and earlier groups who migrated to Europe is widely debated and cannot be settled until matching DNA is found in skeletal remains. Using differences in STR marker value differences, Rootsi calculated the expansion time of the Z2022 subgroup as 7,100 years ± 2,300 years and 10,870 years ± 3,029 years for L497 in central Europe (All info from Berger, miscellaneous L140 data from Adams, Rootsi, Francalacci and over 2,000 L140 samples in G project). G2a2b2b-CTS5434/PF3392 is found in noticeable numbers so far only in Sardinia (Francalacci data). G2b1-M377. Available M377 samples are either (a) those from G-FGC35913/Y15861/Z35318 Ashkenazi Jewish men with known ancestry in northeastern Europe who have a null value for marker DYS425 or (b) a small number of men from the Mediterranean areas and Armenia, and more noticeably from Afghanistan, Pakistan and among Indian Pathans (Sengupta and G Project data). Using STR marker differences Rootsi calculated a coalescence estimate of 5,600 years ago for M377 men, though the age of the overall M377 branch of G is certainly much older. Turkey (Armenians), Pakistan (Pashtuns), Italy, U.K.
Sierra Leone, n.e. Europe (Ashkenazi Jews), Lebanon, Romania, U.K.
Athey et al, Y-SNP rs34134567 Defines a Large Subgroup of Haplogroup G2a-P15. (pdf) Journal of Genetic Genealogy, 4(2):149-150, 2008. Balanovsky et al, Deep Phylogenetic Analysis of Haplogroup G1 Provides Estimates of SNP and STR Mutation Rates on the Human Y-Chromosome and Reveals Migrations of Iranic Speakers. PLoS ONE 10(4): e0122968. doi:10.1371/journal.pone.0122968, 2015. Balanovsky et al, Parallel Evolution of Genes and Languages in the Caucasus Region. Molecular Biology and Evolution, 13 May 2011. Berger et al, High Resolution Mapping of Y haplogroup G in Tyrol (Austria). Forensic Science International: Genetics, 7(5), 529-36, 2013. Bertoncini et al, The Dual Origin of Tati-speakers from Dagestan as Written in the Genealogy of Uniparental Variants. (abstract) American Journal of Human Biology, Volume 24, Issue 4, pages 391-399, July/August 2012. Bosch et al, Paternal and Maternal Lineages in the Balkans Show a Homogeneous Landscape over Linguistis Barriers except for the Isolated Aromuns. Annals of Human Genetics, 70:459-87, (2006). Ghiani et al, Population data for Y-chromosome haplotypes defined by AmpFlSTR YFiler PCR amplification kit in North Sardinia (Italy), Collegium Antropologicum, 33 (2): 643-51, 2009. Haber et al, Influences of History, Geography, and Religion on Genetic Structure: the Maronites in Lebanon, European Journal of Human Genetics, 19(3): 334-40, 2010. Hallast et al, The Y-chromosome Tree Bursts into Leaf: 13,000 High-confidence SNPs Covering the Majority of Known Clades, Molecular Biology and Evolution, doi: 10.1093/molbev/msu327, 2014. Herrera et al, Neolithic Patrilineal Signals Indicate that the Armenian Plateau was Repopulated by Agriculturalists. European Journal of Human Genetics, 10.1038/ejhg.2011.192, 2011. Keller et al, New Insights into the Tyrolean Iceman's Origin and Phenotype as Inferred by Whole-genome Sequencing. Nature Communications, DOI: 10.1038/ncomms1701, 2023. King et al, Differential Y-chromosome Anatolian Influences on the Greek and Cretan Neolithic., Annals of Human Genetics, 72:205-214, 2008. Kivisild et al, The Genetic Heritage of the Earliest Settlers Persists in Both Indian Tribal and Caste Populations. (pdf) American Journal of Human Genetics, 72: 313-332, 2003. Nasidze et al, Genetic Evidence Concerning the Origins of the South and North Ossetians. (pdf) Annals of Human Genetics, 68: 588-599, 2004. Nasidze et al, MtDNA and Y-chromosome Variation in Kurdish Groups. (abstract) Annals of Human Genetics, 69: 401-412, 2005. Olalde et al, Genomic Analysis of the Blood Attributed to Louis XVI (1754–1793), King of France., Scientific Reports, 4, Article number: 4666, doi:10.1038/srep04666, 2014. Poznik et al, Sequencing Y Chromosomes Resolves Discrepancy in Time to Common Ancestor of Males Versus Females. (abstract) Science, 341 (6145): 562-5. 2013. Rootsi et al, Distinguishing the Co-Ancestries of Haplogroup G Y-Chromosomes in the Populations of Europe and the Caucasus. Abstract. European Journal of Human Genetics, (e-pub 16 May 2012 ahead of print), pp 1-8. Semino et al, Ethiopians and Khoisan Share the Deepest Clades of the Human Y-Chromosome Phylogeny. (pdf) American Journal of Human Genetics, 70: 265-268, 2002. Sengupta et al, Polarity and Temporality of High Resolution Y-chromosome Distributions in India Identify Both Indigenous and Exogenous Expansions and Reveal Minor Genetic Influence of Central Asian Pastoralists. (pdf) American Journal of Human Genetics, 78: 202-221, 2006. Shen et al, Reconstruction of Patrilineages and Matrilineages of Samaritans and other Israeli Populations from Y-Chromosome and Mitochondrial DNA Sequence Variation. (pdf) Human Mutation, 24: 248-260, 2004. Sims L M, Garvey D, Ballantyne J (2006). Differentiation of sub-populations within Y-SNP haplogroup G, (poster citation - not available online) Forensic Science Society, Autumn Conference, Wyboston, UK, November 3-5, 2006. Sims L M, Garvey D, Ballantyne J (2009). Improved Resolution Haplogroup G Phylogeny in the Y Chromosome, Revealed by a Set of Newly Characterized SNPs. (pdf) PLoS One, 4: 6, e5792, 2009. Valone et al, Y SNP Typing of African-American and Caucasian Samples Using Allele-Specific Hybridization and Primer Extension. (pdf) Journal of Forensic Science, 49: 4, July 2004. Wei et al, A Calibrated Human Y-Chromosomal Phylogeny Based on Resequencing. Genome Research, 23(2): 388-95, 2013. Zalloua et al, Identifying Genetic Traces of Historic Expansions: Phoenician Footprints in the Mediterranean, American Journal of Human Genetics, 83: 633-42, 2008. Zhao et al, Presence of Three Different Paternal Lineages among North Indians: A Study of 560 Y Chromosomes. (abstract) Annals of Human Biology, 36(1): 46-59, 2009. Ancient DNA samples Includes Haplogroup G samples. 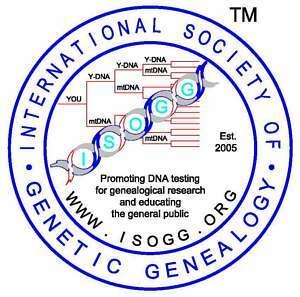 Haplogroup G (Y-DNA) Projects, Rolf Langland, Brian Hamman, Leon Kull, Alain Verschaeren, Alan Berezov, Stephen Asciak, Ted Kandell, Nancy Grossman, Boed Marres, Ben van Beurden. Added Z45748, Z45749, Z45750, Z45751, Z45752 to tree investigation on 1 January 2018. Replaced PH4611 with Y12260, correcting error - location the same, on 5 January 2018. Changed Z30522 to status of Sanger sequencing confirmed on 7 January 2018. Added Z45821, Z45822. Z45823. Z45824. Z45825, Z34823, SK1149, Y30253.2/Z42915.2, Z39523, Z45826, Z45827, Z45828, Z45829, Z45830, Z45831 to tree or tree investigation on 10 January 2018. Added Z45832, Z45833, Z45834, Z45835, Z4583, Y31001 to tree investigation on 11 January 2018. Added Y99471.2, Z45837, Z45838, Z45839, Z45840, Y60799, Z45845, Z45846, Z45847, Z45848 to tree investigation; added Z45841, Z45842, Z45843, Z45844 to tree on 12 January 2018. Added Z45852, Z45853, Z45854, Z45855, Z45856 to tree investigation; added Y32319, Z45849, Z45851 to tree on 14 January 2018. Added Z45860, Z45861, Z45862, Z45863, Z45864 to tree investigation; added Z45857, Z45858, Z45859, Y96635, Y99960, Y101484, Y102902 to tree on 15 January 2018. Added Z45925, Z45926, Z45927, Z45928, Z45929 on 16 January 2018. Added Z45930, Z45931, Z45932, Z45933, Z45934, Z45935 to tree investigation on 17 January 2018. Added Y88703, Y102982, Y104763, Y104770 to tree investigation on 18 January 2018. Added Z45936, Z45937, Z45938, Z45939 to tree investigation; added Z38302, S765, Y18904, Y18939, Y18942, Y18943, Y18945, Y18946, Y45004, Y45186, Y45566, Y46004, Y46201, Y46652, Y46731, Y46898, Y47295, Y48033, Y48038, Y48686, Y49559, Y49754, Y50243, Y50523, Y51552, Y51846, Y51939, Y52467, Y52489, Y52563, Y52927, Y53237, Y53430, Y53460, Y53659, Y53759, Y54430, Y54868, Y55669, Y56022, Y56037, Y56692, Y57005, Y57042, Y57619, Y57770, Y57846, Y58407, Y58532, Z38304, Z38305, Z38306, Z45940, Z45941, Z45942, Z45943 to tree on 20 January 2018. Added Z45944, Z45945, Z45946, Z45947, Z45948 to tree investigation on 21 Janaury 2018. Added Z45949, Z45950, Z45951, Z45952, Z45953, Y37832, Y37945 to tree investigation; added Z45954 to tree on 23 January 2018. Added Z45955, Z45956, Z45957, Z45958, Z45959 to tree investigation on 25 January 2018. Added Z45965, Z45966, Z45967, Z45968, Z45969 to tree investigation; added Z45970, Y64417.2, Y66535.2, Z31271.2, Z45971, Z45972, Z45973, Z45974, Z45975, Z45976, Z45977, Z45978, Z45979, Z45980, Z45981, Z45982, Z45983, Z45984, Z45985, Z45986, Z45987, Z45988, Z45989, Z45990, Z45991, Z45992 to tree on 31 January 2018. Added FGC71549, FGC71550, FGC71552, FGC71554, FGC71562 to tree investigation on 2 February 2018. Added Y128275, Y128488, Y128528, Y128649, Y128712, Y128885, Y129710, Y130402 to tree; added Z45998, Z46000, Z46001, Z46002, Z46003 to tree investigation on 4 February 2018. Added Z46011, Z46012, Z46013, Z46014, ZS6874.2 to tree investigation on 7 February 2018. Added Y130127, Y128747, Y128306, Y129783, Y129499, Z46015 to tree investigation on 9 February 2018. Added Y38327, Z46016, Z46017, Z46018, Z46019 to tree investigation on 13 February 2018. Added Z46055, Z46056, Z46057, Z46058, Z46059 to tree investigation on 20 February 2018. Added Z46060, Z46061, Z46062, Z46063, Z46064 to tree investigation; added FGC23433, FGC23440, FGC23441, FGC23442, FGC23444 to tree on 21 February 2018. Added FGC41974, FGC41975, FGC41976, FGC41978, FGC41980, FGC41982, FGC41983, FGC41985, FGC41987, FGC52600, FGC526091344082, FGC52603, FGC52605, FGC52606, FGC52607, FGC52608, FGC52610, FGC52611, FGC52612, FGC52618, FGC52619, FGC52620, FGC52621, FGC52623, FGC52625, FGC52626, FGC52628, FGC52630, FGC52633, FGC52634, FGC52637, FGC52638, FGC52639, FGC52640, FGC52641, FGC52644, FGC52645, FGC52648, FGC52650, FGC52652, FGC52657, FGC52659, FGC52660, FGC52661, FGC52665, FGC52667, FGC52668, FGC52669, FGC52673, FGC72352, FGC72371, FGC72372, FGC72374, FGC72377, FGC72379, FGC72381, Z31423.2, Z46069, Z46070, Z46071 to tree; added Z46065, Z46066, Z46067, Z46068 to tree investigation on 23 February 2018. Added A20535, Z46072, Z46073, Z46074, Z46075 to tree investigation on 25 February 2018. Added MF1910.2, Z46076, Z46077, Z46078, Z46079 to tree investigation, added S20738, Y51821, Y52092, Y52166, Y52348, Y52917, Y54647, Y56509, Y56565, Y57469, Y58150, Y58884, Y59283 to tree on 26 February 2018. Added Z46081, Z46082, Z46083, Z46084, Z46085, Y112444 to tree investigation on 27 February 2018. Added BY8066.1/GG113.1/Y12749.1 to tree investigation on 28 February 2018. Added Z6111 to tree; added Z46086, Z46087, Z46088, Z46089, Z46091 to tree investigation on 2 March 2018.